Go to shopify.co.uk and follow the steps to set up an account, then choose a design theme and customise your store layout. Alternatively, visit our partner pikikiwi.com and buy one of their themes that have been specifically designed for online art stores. You can also contact them if you have something bespoke in mind - Shopify stores are 100% customisable! 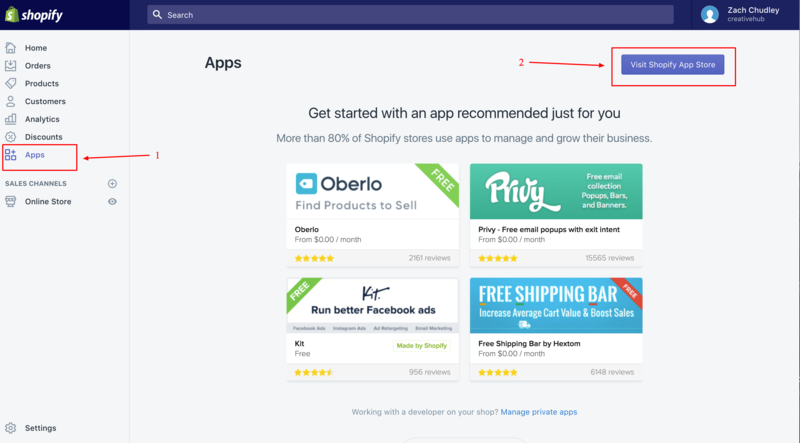 Whilst logged into your Shopify account, click the ‘Apps’ option from the main menu, then select ‘Visit Shopify App Store’. Search for creativehub and follow the installation steps. 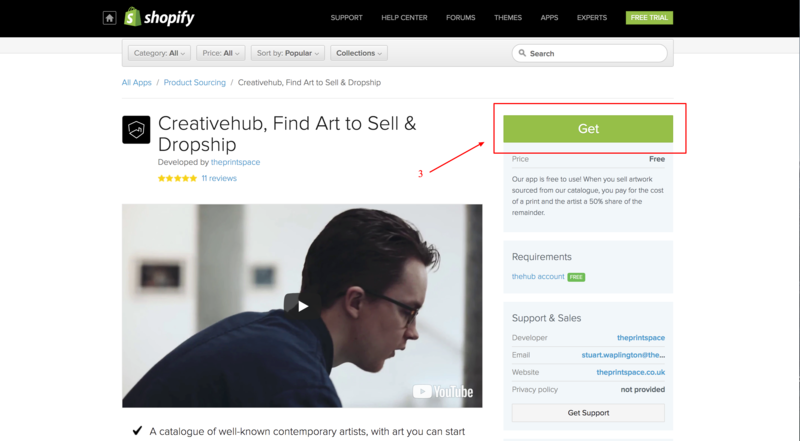 Once installed, your creativehub and Shopify accounts are synced. Log in to your creativehub account. Click ‘upload’ from the top main menu and select the files you wish to upload. Note that files for print must be 8bit and saved as either .jpg, .tiff, or .png. Select the images you wish to sell in your Shopify store by clicking them (they’ll turn dark grey once selected). 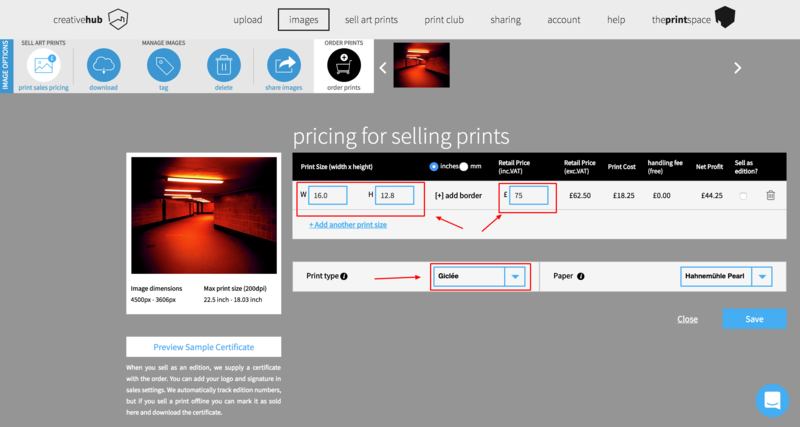 Then select ‘print sales pricing’ from the bottom menu. Select the size and price you wish to offer as well as the paper type. This page allows you to view the production costs as well as profit so you can be sure of your returns. 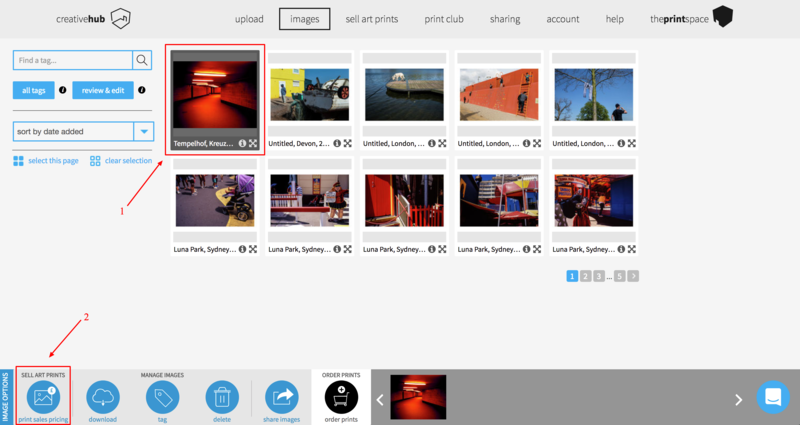 creativehub allows you to sell your prints as limited editions, which come complete with a certificate of authenticy baring your digital signature and logo. As a true white label service you can also have your logo on the packaging your print will be shipped in. 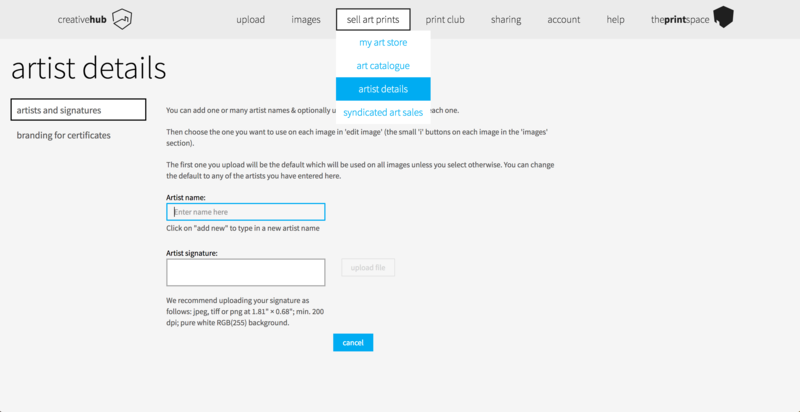 To set these up, select ‘sell art prints’ > ‘artist details’ from the top menu. You can then upload and configure your certificate and packaging details using the menu options on the left of the page. When you sell a print in your Shopify store, the customer pays you the full amount via your chosen payment method (configured in Shopify’s main settings). We then debit you separately for the production costs plus the flat rate shipping of £5+VAT. You’ll need to add a bank card to your creativehub account for this. To do this, select ‘sell art prints’ > ‘sales settings’ > ‘fulfilment payment’. Once the above steps have been completed, log in to your Shopify store and click ‘Products’ from the main menu. You’ll see all the images you applied price and sizes to in creativehub have imported and are now ready to be listed for sale. 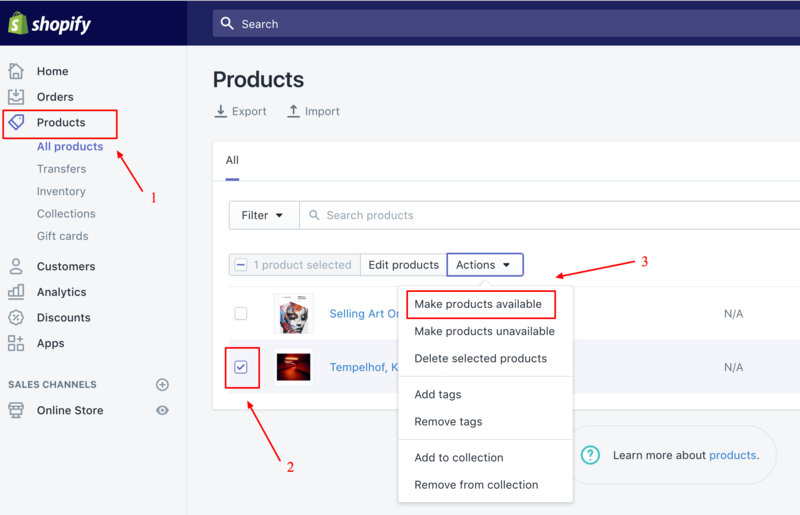 To do this, select the images by ticking the box to the left of the image thumbnail, then select ‘Make products available’ from the ‘Actions’ drop down menu. Great, you are all set up with your new online art store! When a print sells, we’ll handle fulfillment and ship direct to your customer within 48 hours. Now it’s time to start thinking about driving traffic to your online store. There are many ways to do this and I’m afraid no quick fix, but there are certainly great places to start. We have written a free book that covers these topics and more. Grab your copy here!